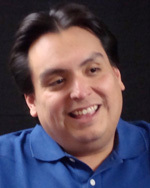 Henry M. Lopez is manager of digital development for Santafenewmexican.com. He focuses on developing digital business opportunities for The New Mexican by reaching across traditional organizational lines. He is a former Web editor and reporter for the newspaper and teaches multimedia journalism online and at industry conferences and fellowships. Henry M. Lopez was writing an obituary for The New Mexican when he was reminded of the power of the press in a grandmother’s kitchen in Santa Fe.